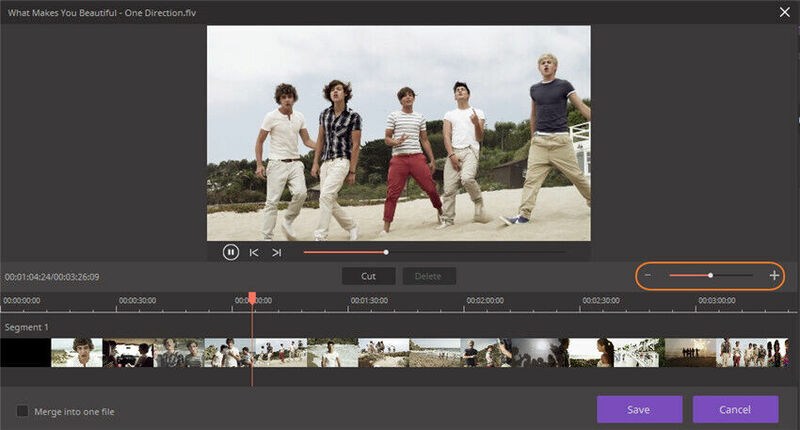 How to Trim Video and Combine Video Clips into One? 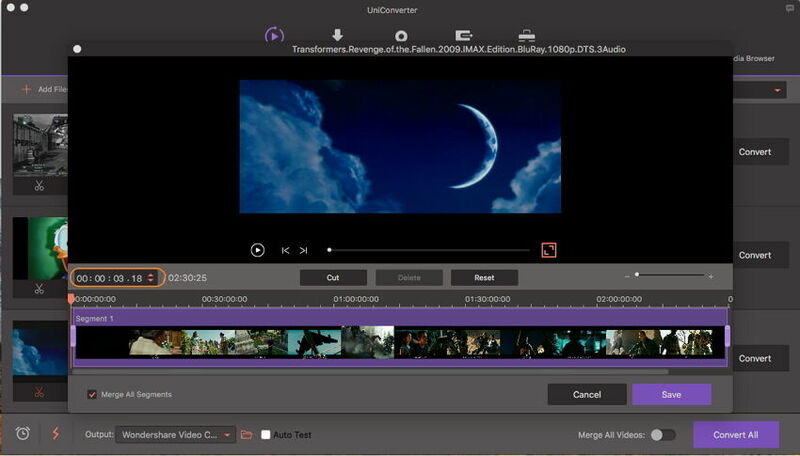 Wondershare UniConverter (originally Wondershare Video Converter Ultimate) integrates a full-featured video editor into the program, which enables you to make professional-looking home movies in minutes. 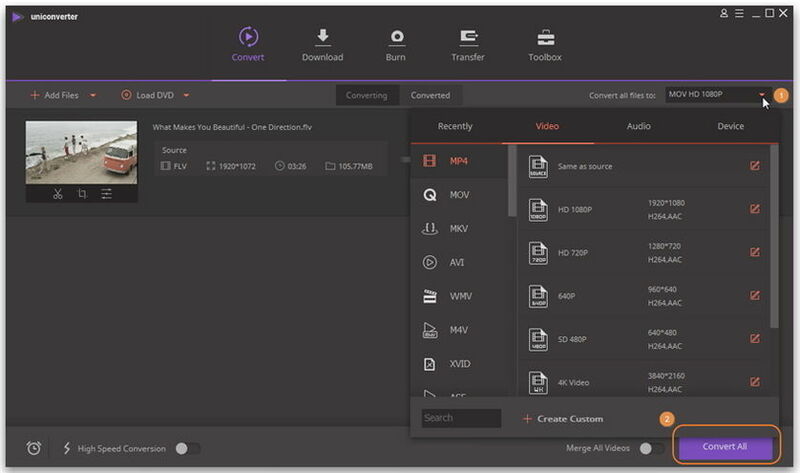 Trimming videos is one of the useful features to edit videos, which can remove the unwanted parts as a video shortener by trimming the unwanted part and combining the left clips together, trim a long videos into several small segments for convenient sharing or watching. 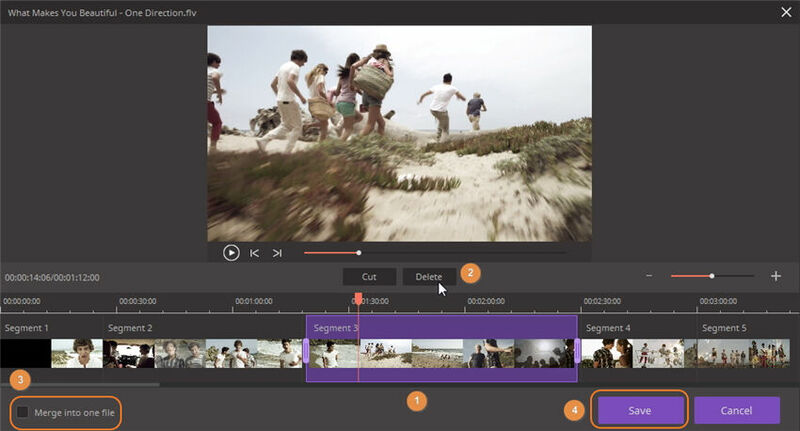 Below lists both video tutorial and detailed steps for you to trim video. 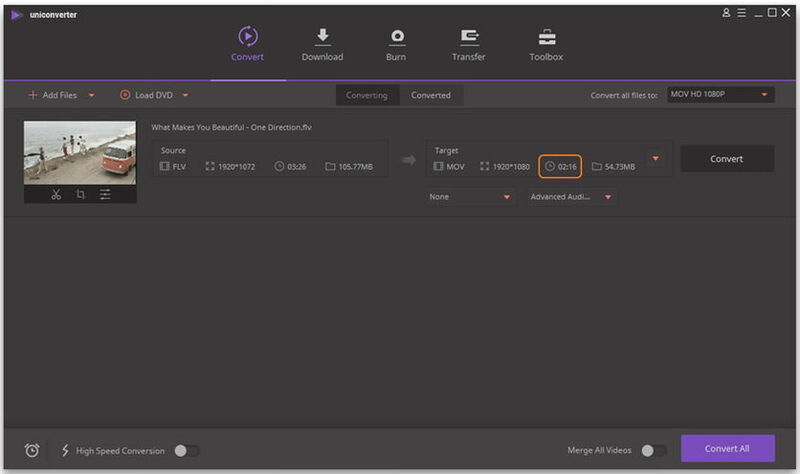 Launch Wondershare UniConverter (originally Wondershare Video Converter Ultimate), then add video files to the program under Convert or Burn section. You'll see 3 editing icons under the video thumbnail and they are Trim, Crop and Effect respectively from left to right. Click the Trim button on the left to get the Trimming window. Situation 1: Trim the end or the start of the video. If you want to trim the video from the beginning or the end of the video, hang your mouse at the rear/front of the clip (Note: For the Windows version, Here you can move your mouse on the time slider and the icon will appear, click it to write the exact time you want to trim), then click the Cut button to cut the video into two parts. Note: For the Mac version, you can set the exact time you want to trim on the marked place as below. Select the unwanted part you want to trim, and click the Delete button and then the Save button to proceed. Situation 2: Cut the middle of the video. 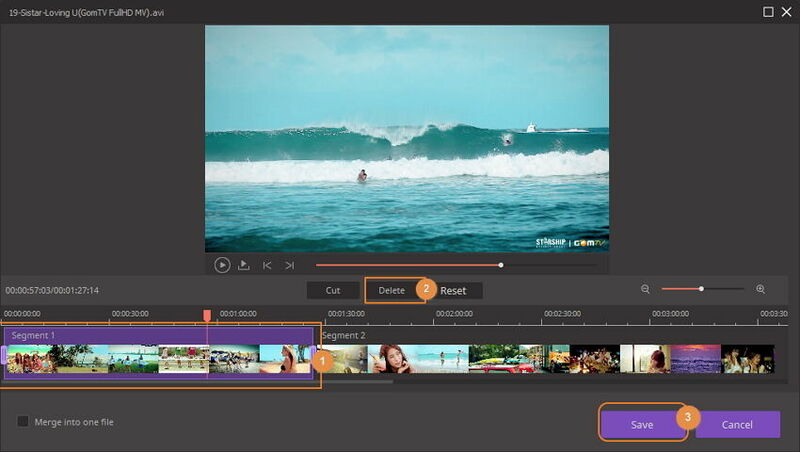 If you need to cut a section in the middle of the video, drag the slider to the start point of the unwanted part and click the Cut button, then drag the slider to the end point of the unwanted part and click the Cut button, press the Delete button to remove the selected part. After that, click the Save button to reserve the operation. 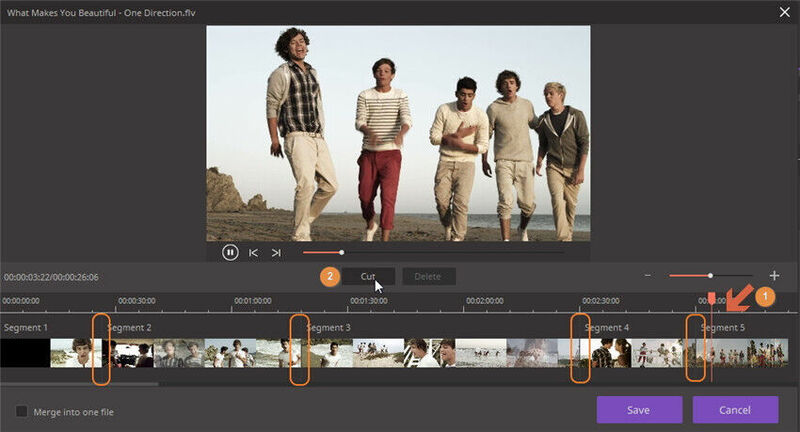 Situation 3: Cut the unwanted part of one video. If you want to delete one segment and combine the left segments into one file, choose unnecessary segment and click Delete. Then check the option Merge into one file and click Save to confirm. 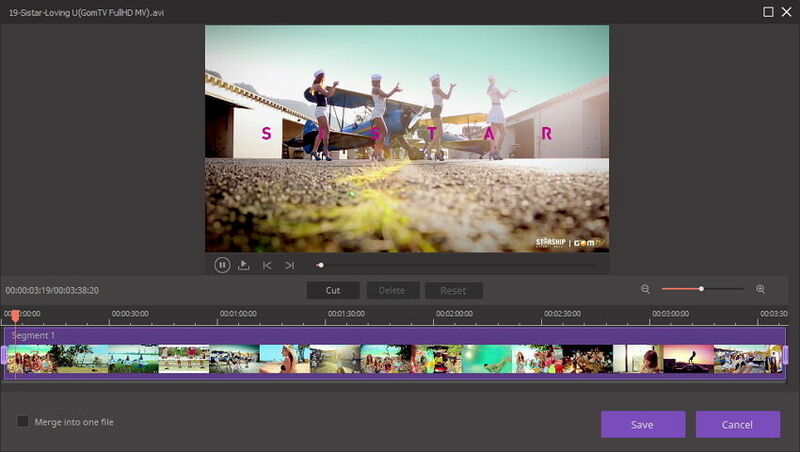 You’d get 1 video clip in the main interface, without the deleted segment. 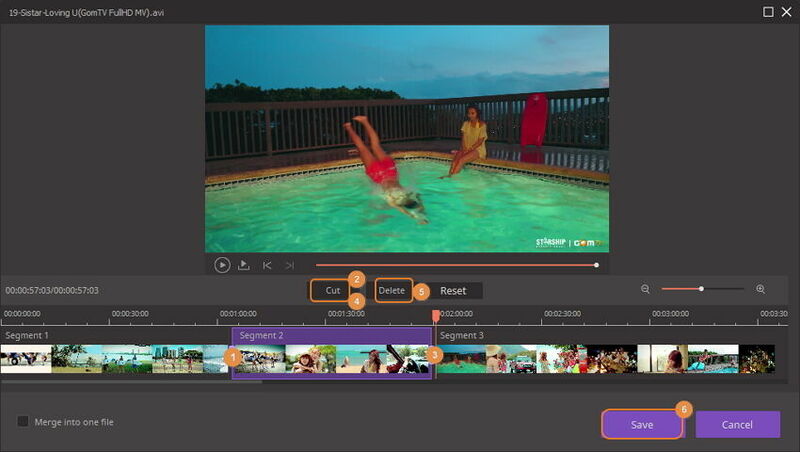 Situation 4: Trim a long video into several clips. 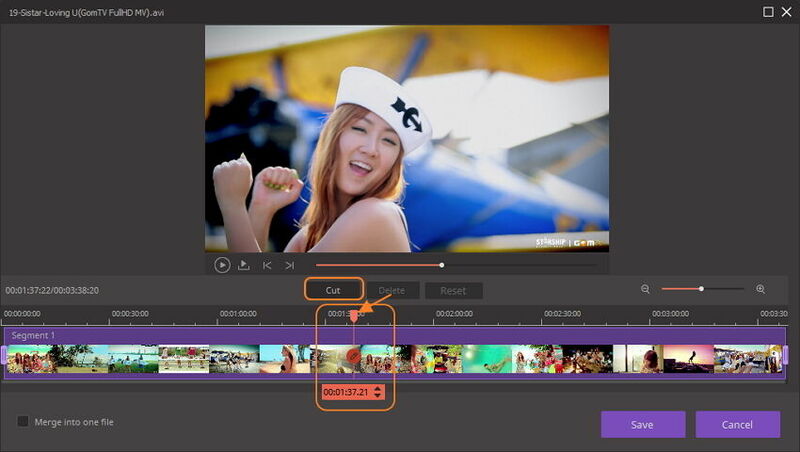 If you want to trim one long video into several small segments, you can drag the time slider to the place you want to trim and click Cut to confirm, loop the steps to cut the segments. The video will be divided into several segments (here take 5 segments for example) correspondingly as the screenshot shows. If you just want to trim the video to 5 segments, click the Save button to proceed. 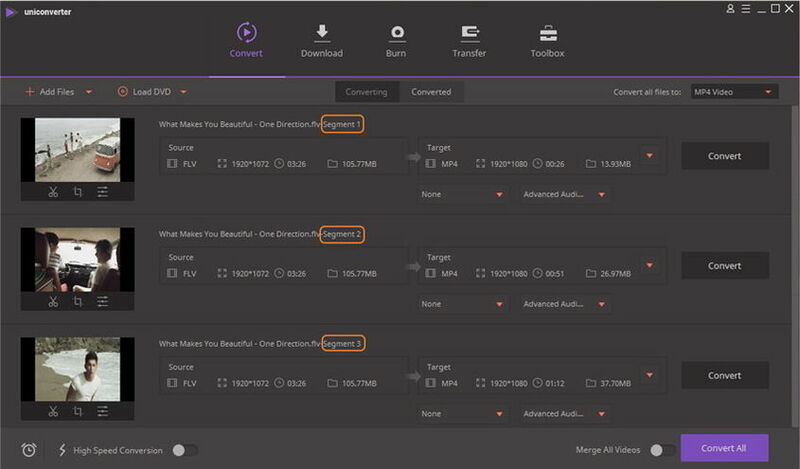 You’ll see 5 video clips in the primary interface, each one named with the segment number. Note: Click the + or – button would zoom in or zoom out the time interval, which helps you to located the trimming place more precisely. Now click the drop-down button beside Convert all files to: to select the format for the edited video and click Convert All to proceed. When the conversion process ends, you'll see the edited video under Converted tab.